If you are interested in charts, there are three books that should go on your reading list. 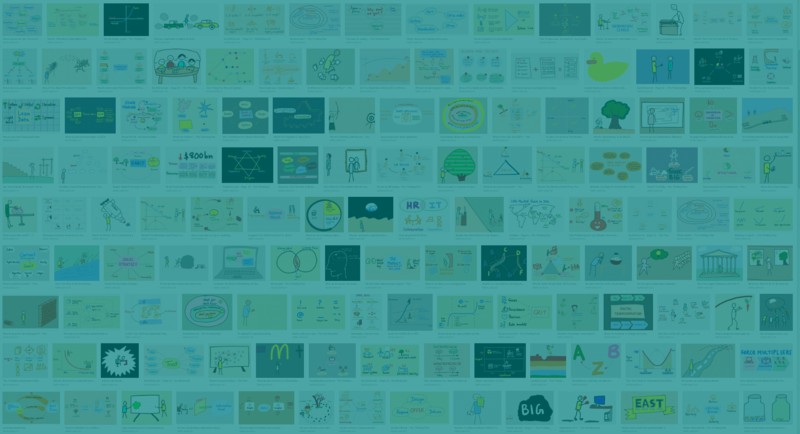 These 6 charts will help you structure the way in which you interact with data – and help you get insights in a systematic way. Much of the data you will analyse will have an order in which it was collected. The Time Series chart is the way in which you get a first look at the data. This chart is the one you use when you want to talk about trends and patterns. A histogram tells you how frequently a value appears within a range. This is the basis of the well-known “bell curve”. In any data set, a large number of values will be close to the average. A small number will be outliers at the lower end or the upper end of the distribution. Is it skewed in some way? Does it fall off like a cliff? The shape of the distribution tells you a lot what could be happening. In energy data, a peak at the wrong time could alert you to equipment being left on. A well-controlled system might have a sharp rise at exactly the time all your equipment is switched on. A Pareto chart is the basis of the “80:20” rule that says that (roughly) 80% of the effects come from 20% of the causes. If you order the causes from largest to smallest, and draw a line that shows you the cumulative percentage, you will be able to quickly identify the factors that matter. You can then focus on fixing the problems caused by these factors, and that will have the most impact on your operations. For example, if you identify three pieces of faulty kit that uses most of your power and repair or replace them, you will have more impact than carrying out 20 maintenance jobs that have a small impact. The Pareto chart helps you focus and direct your efforts on the things that really matter. A scatter plot shows you the relationship between two factors. Are they linked, or is there no connection between them? The main purpose of a scatter chart is to help you understand the relationship between cause and effect. For example, the temperature outside affects some organisations more than others. If you have a commercial building, a cold day will probably result in you increasing your energy usage for heating. A factory on the other hand, where most of the energy is used by process equipment may not be dependent on the weather at all. A scatter plot will help you to identify the relationship between factors and make sure that you draw the right ideas about cause and effect. A pie chart is almost always the wrong thing to use to show data. Instead, a rank chart gives you much more insight. A rank chart is a bar graph, sorted so that the largest item is on the top and the smallest at the bottom. You can draw attention to the item you want to show by highlighting it in a different colour. This helps you show the relationship between items or between one item and the rest. The control chart is a little used chart, but probably one of the most useful. A control chart is created by adding two lines around a time series or run chart. These lines are calculated by the amount of relative movement in the data, worked out using standard deviations or a similar method. The purpose of the lines is to tell you when one of changes in value is statistically significant. J.P Morgan, the famous American financier, was once asked what he thought the stock market would do today. His answer – “It will fluctuate”. Values go up and down. Too many people think they have to explain every variation, but this is hardly ever useful. The thing you need to figure out is which bits of the series is noise, where values are simply fluctuating like they did in the past and will do in the future, and which bits are signal – indicatnig something different is happening. The control chart gives you a way to do that. When the line chart goes above or below one of the control lines, something significant has happened. For example, in a manufacturing process, perhaps something was moved unexpectedly, or a fault occurred and the power went off. A control chart lets you only act when you need to – and lets the “voice of the process” tell you when something is happening that is unusual and needs to be looked at in more detail. Time series charts to understand the trends in the data. Histograms to understand the shape of the data – is it normal or is something odd going on? Pareto charts to focus on the things that matter. Scatter plots to connect cause and effect. Rank charts to compare items with others. Control charts so you can take action only when something significant happens. 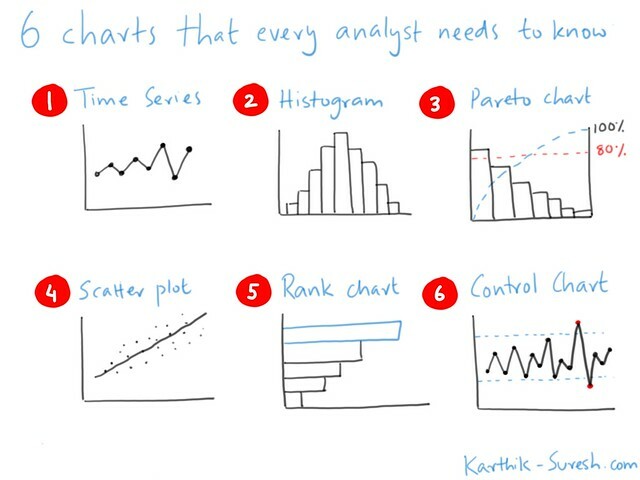 There are more references in the books mentioned at the start of this post, but mastering these 6 charts is a first step towards carrying out good data analysis. Battery storage systems are one of the most anticipated technologies in the energy market at the moment. But will they save you money and how do you put together a business case? These are my notes from a podcast by Barry Cinnamon of Cinnamon Solar from May 2016, along with some additional research and comments. The whole podcast is well worth listening to and you can find it here. First, what do we mean by practical? A practical system has to first be affordable, and second be useful. Above all, this means it must save you money. In the United States, there are around 450 battery storage systems in homes and around 5000 commercial installations. Germany, on the other hand, has over 25,000 installed systems. Energy storage systems are seen as a crucial part of the energy transition happening in Germany (Energiewende). There are already more than one half million solar installations with a capacity of 40 GW in the country. It makes sense to add battery storage systems to these installations so you can squeeze the most energy out of them. Germany Trade and Invest (GTAI), forecasts that 50,000 battery solutions could be installed each year by 2020. Batteries are not a good choice for backup power for a few hours to a few days. To provide a full supply to a normal house you need a big battery system. It’s much larger than the normal capacity of a grid connected wire. You also need additional circuitry, permits and contractors to carry out the work. The system will struggle to give you continuous power for a long time, especially if you lose power for days. It’s much easier and cheaper to just buy a generator for backup power, but it’s obviously more polluting. People are very excited about battery storage because it will help you store energy where it is cheap and use it when it is more expensive. It costs $10,000 for a 10kW battery system that has 4,000 charge / discharge cycles. This means it has a life of around 10 – 11 years if used once a day. The cost per day of the system is therefore $10,000 / 4,000 = $2.5 per day. If the system runs for 1 hour and generates 10 kWh of energy, the cost per kWh is $2.5 / 10 = 25 cents per kWh. Let’s say the cost of electricity from the grid during the day is 50 cents during the day and 15 cents during the night. So, if you were able to charge the battery at night and then use it to offset expensive power during the day, you have just saved 50 – 15 = 35 cents. At the same time, putting in the battery system has cost you 25 cents. So, your saving is 35 – 25 = 10 cents. There is a saving, but it’s marginal and you need to get everything right. 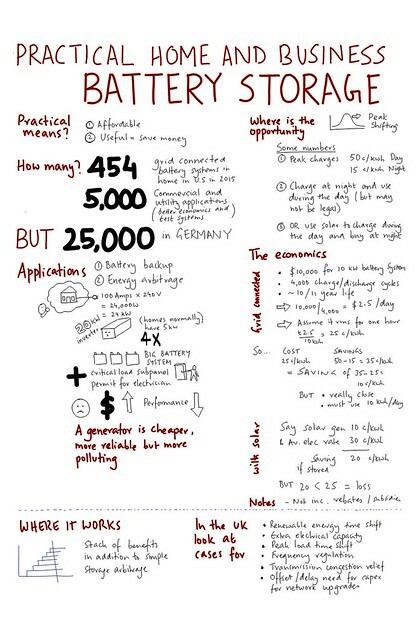 What happens when you put a battery storage system into a solar PV installation? If the saving from your solar generation is less than 25 c/kWh, then you will lose money by adding a battery system that costs 25 c/kWh into your installation. This excludes any rebates or subsidies that apply, and just looks at a straight business case. How can you make the business case work in the UK? The secret is getting your stack of benefits right in addition to simple storage arbitrage? In Q3, 2016, National Grid bought around 200 MW of frequency response services, mainly through battery systems. Their balancing services page is a good place to start if you want more information. In summary – you can make money by putting in batteries, but it’s not going to be as easy as you hoped. It’s important to understand the different ways in which the cost of power stacks up in your country and what this means for the savings you can make. For the UK in particular, schemes change all the time. That means you cannot guarantee your savings and need to create a business case can handle this. One way is to introduce probabilities into your model and work out the “expected value”, and “confidence level” of the schemes. Doing this means you can say that you are 95% confident of achieving a saving of X. This can help you build an overall business case so you know how much you could make. How sustainable is your organization and how can you tell? How sustainable is your company? Are you an organisation that needs to report on its environmental and social performance? And is this exercise simply another regulatory burden or does it help you succeed in the marketplace? 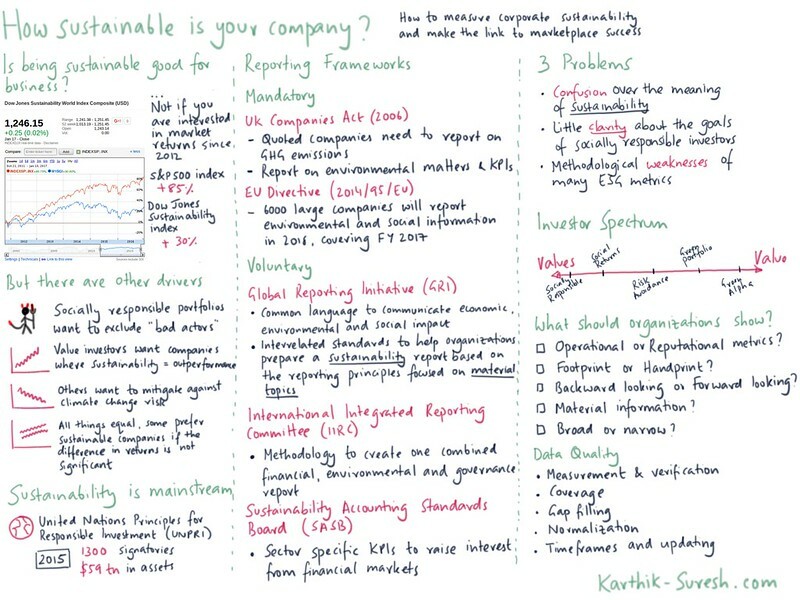 This post looks at the state of sustainability reporting in the world and what needs to be done to make sure that the value created by sustainable companies is fully recognized by investors and financial markets. Assessments of corporate sustainability have been around for decades. RobecoSAM, a leading investment specialist, questions over 3,400 companies every year on the economic, environmental and social factors that contribute to their success. The Dow Jones sustainability indices are based on RobecoSAM’s methodology. So, how well does the sustainable index do when compared to the rest of the market? Not that well, it turns out. Since 2012 the S&P 500 index is up 85% while the Dow Jones sustainability world index composite is up 30%. It might not just be about performance, but you could have gained almost 3 times as much by not worrying about sustainability. Not everyone is interested just in financial returns. Some organisations such as churches and environmental groups may not want to invest in anything that they see as “bad”. This might include alcohol, tobacco and guns. Some may include or exclude nuclear power depending on how good or bad they see that technology. Some investors see a future where companies that have sustainable practices will do better than those that don’t. For example, socially responsible retailers might be expected to take market share from those that don’t demonstrate such behaviour. Other investors might see certain sectors as being more exposed to risks from climate change. For example, they might want to avoid banks that hold stranded coal plants or insurers that have flood risk liabilities. Still other investors may simply prefer sustainable companies to non-sustainable companies as long as the returns don’t diverge too much from expected market performance. 1300 organisations controlling over $59 trillion in assets have signed up to the United Nations Principles for Sustainable Investment. Some of the largest companies in the world including Google, Walmart and Apple are taking significant steps to make their operations and supply chains more sustainable. A crucial element of sustainable development is the use of robust sustainability reporting frameworks. In the United Kingdom and Europe some companies and many public sector bodies have a mandatory requirement to report on the environmental and social impact of their organisations. The legislation is designed to not be onerous, using existing systems and data collection where possible and leaving it to the discretion of the companies to choose what they include in their annual reports. The Global Reporting Initiative (GRI) is the oldest such standard and tries to bring in a common language so organisations can communicate their economic, environmental and social impact and help stakeholders understand more about them. The GRI standards are interrelated documents that help companies prepare a sustainability report focused on material topics in a form that follows the reporting principles set out by the GRI. There are three main problems with existing sustainability reporting. First, there is confusion over what is meant by sustainability. Does it cover just the carbon impact of an organisation’s operations or should include its supply chain? Should larger organisations be held to a more stringent standard? Secondly, what are investors looking for? Not all investors are the same and is it possible for one single report to meet the needs of different types of investors? Thirdly, the way in which metrics are calculated have methodological weaknesses. Given this, is it appropriate to compare companies on the basis of the metrics reported or do investors need to carry out more investigation? Socially responsible investors will invest in sustainable companies and exclude “bad actors” from their portfolio on principle, even if they have to accept worse returns. Investors looking for a social return on their investment will take factors such as the community benefit of projects into account in addition to the financial return on investment. Investors looking to avoid risk will tilt their portfolio towards companies that they feel will not be disadvantaged by the impact of climate change. Investors looking to green their portfolio will choose, all else being equal, sustainable companies instead of non-sustainable companies. Finally, investors looking to profit from a decarbonised economy want to select sustainable companies that they feel will outperform the market. How should organisations appeal to these different kinds of investors? Many ESG metrics are based on reputational measures such as feedback questionnaires or social media research. Could organisations use more operational measures that allow for better comparisons? Most companies focus on the impact of their operations measured in terms of their carbon emissions. It may be better, however, to focus on whether products and services contribute to sustainability. In other words, is their carbon handprint bigger than their carbon footprint. ESG metrics are almost invariably backward looking. This might mean some companies are excluded because of their history. For example, Volkswagen is currently under pressure for its role in diesel emissions fraud. The company, however, will have to radically transform itself in order to recover from the scandal and may actually be a good choice from a sustainability point of view in the future. It is still hard to see any clear links between the sustainability metrics collected by organisations and their success in the marketplace. Are organisations collecting the right information? There is still much research that needs to be carried out to determine which metrics are material and will link sustainability and organisational performance. Finally, investors may need to select metrics that are appropriate for the kind of investing philosophy that they follow. A broad approach may be less effective than a narrow one where a set of robust comparable metrics are used to evaluate similar companies. Effective data collection underpins good sustainability reporting. Wherever possible data needs to be based on measurements rather than assumptions, and should be verified. To be useful, data needs to cover a long enough time frame so that patterns and trends can be identified. Where there is missing data, as is often the case, methods used to fill gaps must be transparent and robust. It may be necessary to normalise data before it can be compared. Once again, the method used to transform the dataset must be robust and transparent. Finally, updating information once a year may not be sufficient for investors. It may be necessary to provide guidance and enter information sooner, for example using quarterly reporting. In summary, as more companies commit to becoming more sustainable there will be a greater need for good quality sustainability reporting. Investors and financial markets will pay more attention to good reports and should reward companies with greater success in the market. 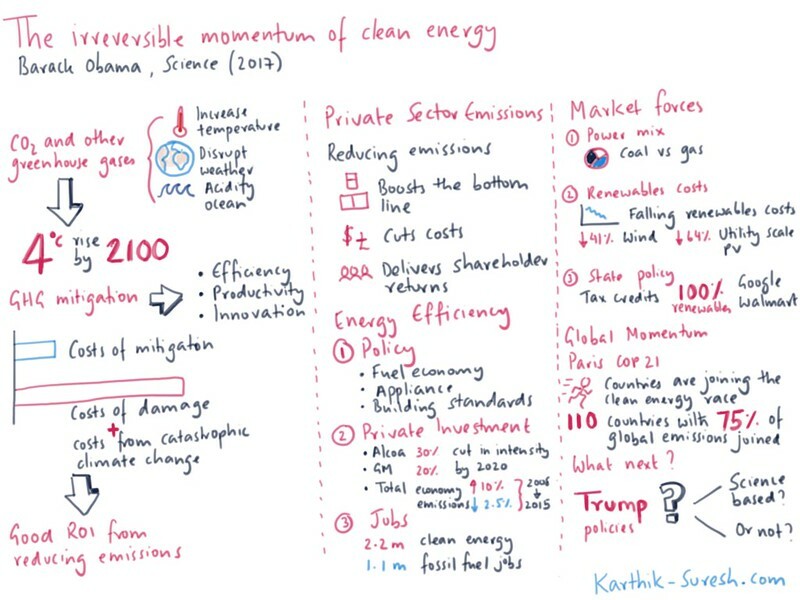 The irreversible momentum of clean energy (sketchnote)How can President-elect Trump make the right policy decisions on clean energy? An article by a sitting President may help. President Obama is thought to be the first sitting US president to author an article in the high profile peer reviewed journal Science. In the article, President Obama argues that the global momentum towards taking action on climate change is now irreversible. Carbon dioxide and other greenhouses cause higher surface air temperatures, disrupting weather patterns and acidifying oceans. Some policy makers and influential stakeholders still do not agree, however, and in the short term that continues to be a problem for a number of economies, not least the United States. Climate change policy could slow down or be reversed under a new administration if staffed by climate change skeptics. This is not a good economic move. Taking action on climate change is good for business. The United States has grown its GDP by 10% since 2008 while emissions from the energy sector have fallen by 9.5%. Ignoring carbon pollution, on the other hand, could result in economic damages annually of 4% of GDP, or between $340 – $690 billion lost in federal revenue every year. This is without taking into consideration the impact of catastrophic events or the impact of climate change on economic growth. President Obama’s administration has encouraged fuel economy, appliance standards and building standards that will cut over 10 billion tons of carbon by 2030. Major corporations are setting challenging targets. Alcoa and General Motors are working to reduce their energy intensity by 30% and 20% respectively by 2020. Clean energy creates jobs. 2.2 million Americans now work in clean energy, compared with 1.1 million in the fossil fuel supply chain. Coal is being replaced by natural gas as the primary method of generation. Low cost gas is displacing coal and, despite problems with methane leakage, is a cleaner generation technology. Plummeting renewables costs are ramping up the capital inflows into projects supporting wind, rooftop solar and utility scale solar, supported by public policy measures. Battery technology could help squeeze even more power out of existing and new installations. Major companies such as Google and Walmart are committing to sourcing 100% of their energy from renewable sources by as soon as 2017. For the first time the United States and China, along with other major economies, agreed to set out ambitious climate policies that would be transparent and accountable. Delivering on this commitment would increase the changes of limiting temperature increases to under 2 degrees by 50%. Countries will set national policies and companies will respond by innovating, creating new technologies, jobs and export markets for clean products and services. Over $1bn has been committed by investors to support clean energy breakthroughs. Countries that pull out now are going to miss out economically. A new policy direction will emerge under a new administration. Will it be science based, building on the global consensus on the evidence for climate change and the need for action? Or will it roll back policy and stop funding for clean energy and technology? We will know more over the next year. The long term trend, however, for global policy over the next few decades is unlikely to reverse as countries move to creating low carbon economies in order to reap the benefits and avoid the damages from climate change. Vehicle emissions make headline news, with Volkswagen pleading guilty to criminal charges in the US and agreeing to pay fines of $4.3 billion (£3.5 billion) as a result of committing vehicle emissions measurement fraud. The company may end up paying more than $20 billion in the US alone. It still doesn’t know how much it will pay in Europe or elsewhere. Pressure to cut transport emissions will continue to grow as a result of the Paris agreement. The need to stop climate change will mean governments continue to use policy, regulation and the tax system to improve air quality and cut emissions, especially in large cities and metropolitan areas. London’s congestion charge zone has been in place for nearly 14 years, raising over £2.6 billion and reducing traffic volumes by 10%. The Mayor of Paris, Anne Hidalgo, wants to cut the number of cars in the capital by half. Six city-wide clean air zones are due to be in force by 2020 in the UK in Birmingham, Leeds, Southampton, Nottingham, Derby and London but could be extended to another 10 cities. The tax system in the UK already favours low emission vehicles. Tax rates are based on engine size, fuel type and carbon emissions. The lower the emissions, the lower the rate of income tax paid by the owner or driver. Fleet managers are in a unique position to cut costs by improving the energy efficiency of their fleet, avoiding both external charges such as taxes and congestion charging and lowering operating costs of their cars, vans and heavy goods vehicles. Many organisations still don’t have a good record of the number of vehicles they have and how they are being used. Some of the information should be in recent ESOS audits although the data may be getting stale a year on from the compliance deadline. grey fleet cars, where drivers receive mileage payments for using their cars for business use. The data you need will include vehicle details, fuel receipts and mileage logs. If you don’t have a system to collect this information already, the data is likely to be patchy and require cleansing before being analysed. How do vehicles help you carry out your company business? Do you have a large number of staff commuting to work in central offices? Do you have a large number of small deliveries, or a small number of large deliveries? Do you operate a just-in-time system or a milk round? Understanding this requires analysing the transport data you have in your organisation and have collected during the audit. You may see patterns in how mileage is racked up. You may see where the opportunities are in reducing or eliminating mileage. You may also start to see where the barriers are in your organisation. Departments may not want you messing about with their journey planning and vehicle purchases. Individuals may be concerned about how your data will affect their own positions. In many organizations vehicles are a seen as a symbol of status, with increasing vehicle allowances as people progress upwards in the organization. The key thing is being able to see where the opportunities might be for changes in fleet composition and usage that could lead to cost savings for the organization. You will not be able to get leadership buy in without being able to show the cost savings that are available from increasing fleet energy efficiency. The leaders in the organization need to see cutting transport emissions and costs as a strategic imperative, setting and committing to targets. Marks and Spencer, for example, has a goal to improve its own efficiency by 50% by 2020. It set a challenging target in 2007 of improving fuel efficiency in the UK and Ireland by 35% by 2015. It nearly got there, reporting a 33% reduction in 2014/15, but where would it be without a target to aim for? Once you have targets in place, the very next step is to set up a robust monitoring and verification system, including telematics and tracking. Without an easy to use data collection system that can be updated quickly an energy efficiency campaign can lose momentum and start to slow down. Transport policy in companies can be a very sensitive issue. The top people in the organization often have the biggest and least efficient vehicles. Asking them to support you in reducing fleet emissions is going to be a personal issue for some of them and the people that report to them. But cutting transport emissions is good business for the organization and will cut costs in taxes, congestion charges and expenses. The impact needs to be managed fairly so people can see the need and reasons for changes in policy. 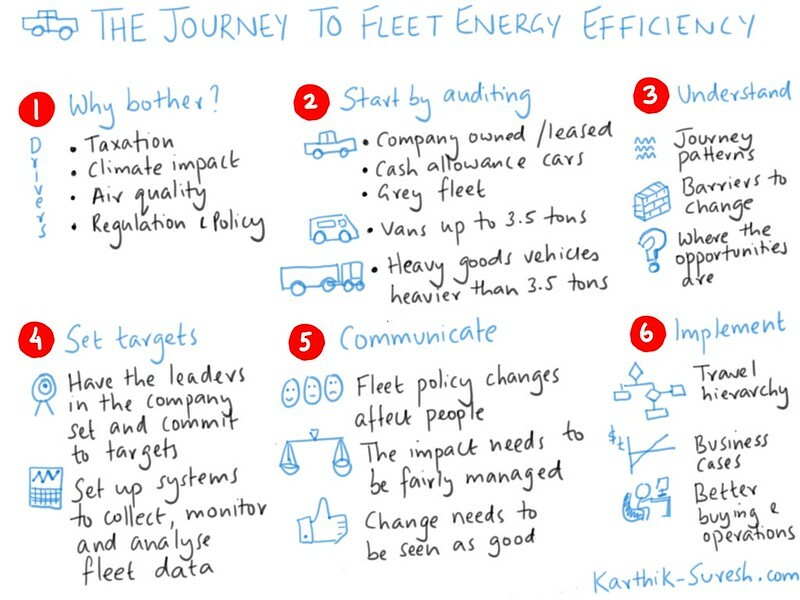 Fleet energy managers need to be good marketers, communicating and informing the people in their organization of how the work they are doing will impact and improve conditions for colleagues, suppliers and customers. Make it easier to work remotely and from home? Cut the payments you make that incentivise people to drive instead of sharing cars or using public transport? Improve route planning and schedule trips for when congestion is light as idling is a major source of emissions. Encourage audio and video conferencing instead of travelling to meetings? Major changes such as buying a transport monitoring system or investing in telematics will need you to pull together a business case. Are you making sure that all the costs of transport are covered in these cases and not just the operating and fuel costs? A full business case may include a life cycle analysis that means low emission vehicles become a more sustainable option for your business. As you go forward, buying the right vehicles and using them more efficiently will help you transform your fleet and reduce emissions, eliminating unnecessary mileage, making the most of public transport and conferencing solutions, and cutting costs for your business. The pressure to improve transport energy emissions will be a particular challenge for fleet managers who need to think about the carbon impact of their operations in addition to fleet purchases and journey planning. Improved data and analytics will help make the case, guided by a clear strategy from the leadership team, with fleet managers in a position to make real and lasting cost savings for their organizations. The Energy Glut: The Politics of Fatness in an Overheating World. By Ian Roberts with Phil Edward. 2010. How can you make the world a healthier place by taking action on climate change? This book by Ian Roberts with Phil Edwards, “The Energy Glut”, links obesity – a health issue faced by an increasing number of countries to climate change. These two do not seem obviously connected – surely obesity is something that people do to themselves by choosing to eat more and exercise less. And the way to tackle obesity is to tell people that they should get better habits and train them how to eat more healthy food and exercise in gyms with all the equipment they need to keep fit. But here lies the root cause of the problem according to the authors. In developed countries everyone is getting fatter. Sure, there are some very thin people and some very fat people. But as a distribution, on average, populations in developed countries have a higher body mass index (BMI) now than they did a decade ago. Why is this? Has everyone simply caught the same “bad habits”? Or is something else going on? What is happening is that people are eating less than before on average. The problem is that they have reduced the amount of activity they do by even more than that. And the imbalance between the amount they move, and the amount they eat is stored up as fat. So why do we move less? Two obvious reasons are increasing amounts of TV watching and car ownership in households. We spend a lot more time sitting and watching TV than we did before. We also spend a lot more time in our cars. One of the best charts in the book shows the correlation between BMI and gasoline consumption per person in 130 countries. This shows that as the amount of fuel used by individuals increases, the average BMI of the population rises. In other words, car usage is linked to obesity. As car usage is a major contributor to climate change, the book argues that climate change and obesity are linked. As we make changes in our built environment to address climate change, creating car free cities and pedestrian friendly public spaces – we will tackle not just the problem of an overheating world but also population health. Paris is leading the way, with plans to cut traffic in the capital and pedestrianize the city center and encourage low carbon transport such as electric cars. This is not going to be easy. Transformation never is. But there will also be opportunities for companies that see how things are moving. For example, Jaguar Land Rover plans to build electricity vehicles in the UK if the infrastructure can be put in place. A commitment from a major player like that could make a big impact on the European market. The book argues that cutting our dependence on fossil fuels and using cars less will lead to lower levels of obesity in populations. But societies need to create an environment that makes walking and cycling an easier option than driving. So… in summary, the problem of population obesity is at its heart a political problem, and needs political action to be solved – and policy measures that decarbonize transport will also help tackle obesity. How can companies use an energy strategy to unlock value for their organization? And why do so many fail to get started at all? 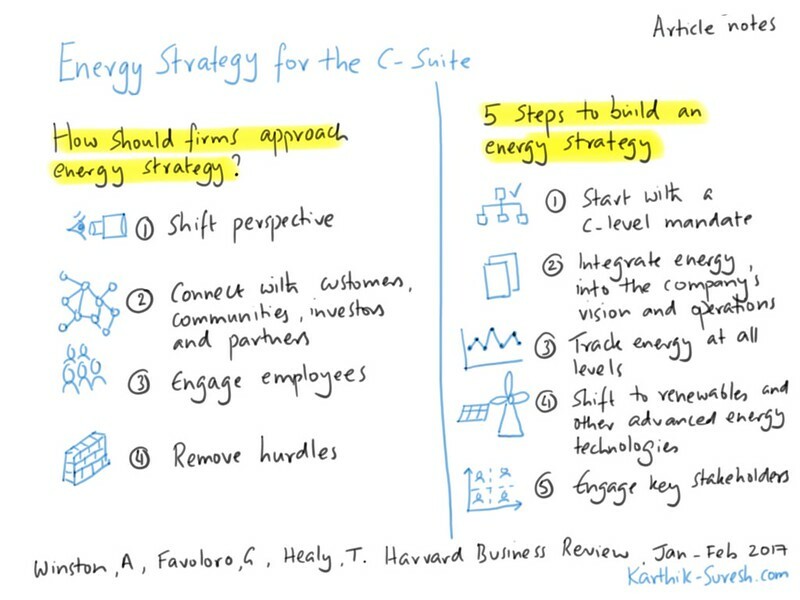 In their article “Energy Strategy for the C-Suite”, Andrew Winston, George Favoloro and Tim Healy look at how companies can create competitive advantage by influencing their cost structure through the choices they make about how they buy and use their energy. Companies in sectors such as ICT, agriculture and the food industry are developing energy strategies and setting targets to cut energy and carbon in their supply chains. Most of them, however, are doing this without an explicit framework or playbook. The authors suggest that a systematic approach is needed. The biggest obstacle to progress is not having a clear mandate in place. The CEO needs to lead on this. Commitment from the top with the right resources allocated to a team is key to developing a strategy and guiding execution. Once a team is in place, it needs to understand how the company uses energy, develop an energy and emissions reduction plan and set targets that are based on climate change science. The team then needs to implement the plan, integrating it into operations and creating incentives for people in the company to work on energy reduction. In particular, the people who buy energy need to work with the people who use energy to reduce risk and cost. An important step is to record, monitor and analyse energy data. This needs to happen not just in the company’s own facilities also along the supply chain to see how it can work with suppliers and customers. Companies need to understand their options when it comes to clean energy technology. This includes working out which technology mix, whether generation or energy efficiency measures, will provide a least cost solution to the company, taking all costs into account. In particular, companies need to understand how going green can increase the amount of business they do with other companies that have also committed to greening their supply chain. A shift to local energy generation and consumption means that companies will need to engage much more with their local stakeholders and communities. In addition, analysts are increasingly looking at how good and effective companies’ sustainability strategies are when they recommend them to investors. Engaging employees is crucial to executing an energy strategy. Inviting them to participate in searching for energy efficiency opportunities and communicating with them about how the company is going to meet its climate change commitments is going to cut costs and increase employee commitment to the organisation. In summary, creating and implementing an energy strategy can unlock value for an organisation – but you have to do it the right way. What are science based targets and how can they help with energy management? Science Based Targets are an initiative set up by WWF, the World Resources Institute, the UN Global Compact and CDP. The CDP holds and provides data on consumption and emissions from companies and cities around the world. Some of these datasets are free to access. For example you can view and chart Scope 2 emissions (emissions from purchased electricity, heat, steam and cooling). This shows that major emitters include miners, steel makers and retailers. Scope 2 emissions are important because they are caused as a result of activities that companies can control and change. Transparent information on the level of Scope 2 emissions could cause companies to increase their purchases of renewable energy and step up energy efficiency measures. The corporate sector is the world’s largest source of emissions. 80% of the world’s 500 largest companies have targets in place. But the Guardian says that most global companies still don’t have any obligation to cut emissions. They do try, but what they do isn’t enough to make a real difference. The pressure on companies to have some form of commitment, target and measurement and verification system is likely to continue as countries recognize the need to reduce emissions and decouple GDP growth from energy usage. How do you set Science Based Targets? The SDA looks at how similar energy intensive companies can choose the lowest cost technology mix to meet their energy demand. The SDA looks at how sectors differ from each other, the potential for reductions and how quickly each sector grows over time. A free web-based tool has been developed for companies to use but is currently offline. Developed by McKinsey, WWF, CDP and Point 380, US corporates would cut emissions by 3% per year overall, while individual corporates would have tailored targets using a tool called the Carbon Target Profit Calculator. This tool tells you how much you could save if you followed its guidance. BT (British Telecom) have come up with a Carbon Stabilization Intensity (CSI) target in 2008 is calculated by comparing its emissions with how much it as a corporation contributes to GDP. The contribution to GDP is defined as “value-added”, and the CSI is measured as the emissions per unit of value added. BT’s CSI target is to reduce CSI by 20% by 2020. Corporate Finance Approach to Climate-Stabilizing Targets (C-FACT) is a relative target that divides a company’s greenhouse gas emissions footprint by its GDP contribution (measured by gross profit) and calculates a Carbon Intensity Reduction Rate that takes into account growth rate. The company then commits to the target, creates an annualized pathway and works its plan. The Center for Sustainable Organization’s (CSO) developed a context-based carbon metric along with Ben & Jerry’s in 2006. The metric compares emissions from an organization to targets based on climate change mitigation scenarios. It works out an individual target that looks at how the organization will grow and is updated based on what others are doing and the change in global emissions over time. The GEVA analysis suggests reducing greenhouses gases per unit of GDP by 5% a year to meet the 2 degree target, which then translates into a corporate target of 5% reduction in GEVA per year. This seems similar in form to the BT-CSI at first glance. The MARS method targets Scope 1 and Scope 2 emissions, where it has direct control and selects to “overdeliver” on targets on these emissions by targeting a reduction of -100% in 2040 rather than -80% in 2050. This takes pressure off Scope 3 emissions that cover agriculture and are harder to influence. It is also based on an absolute reduction, with the objective to reduce Mars’ emissions by 8-% from its level of around 14 MT. What about carbon budgets in the UK? The one method missing from the Science Based Targets initiative is the system of carbon budgets in the UK – although the difference is that the initiative targets global companies. The Climate Change Act in the UK set a target for the country to cut emissions by at least 80% by 2050 from 1990 levels in order to limit global temperature increase to as little as possible above 2 degrees C.
The first five carbon budgets covering the period to 2032 are now set in law. For UK companies, these are targets that guide the policies introduced by the government such as subsidies and carbon taxes. Energy efficiency improvements are cost effective and save money. Supporting innovation in technology will increase costs in the short term but help in long term. As we move towards the long-term target, we should use measures that cost less than the carbon price projected by the government if available. The budget is set to be consistent with EU targets – but we will need to wait and see how EU and UK climate change policy evolves after Brexit. The Science Based Targets initiative is a significant step in the right direction with commitment from some major companies. Implementation by some of the largest companies in the world will cause a ripple effect through their supply chains and reduce emissions far beyond their own companies. But there are concerns over whether the voluntary targets can be met and whether companies are even reporting their carbon footprint correctly. Finally, companies in the UK should consider whether they should align their targets with UK policy or a global initiative – and to a large extent this will depend on whether their emissions are created in the UK or internationally.